I remember swooshing down the mountain in the powder coated mountain like it was yesterday. Sadly, it was a while ago….before kids. It was the most adventurous experience I have had so far in my life so if you are a an avid snowboarder or skier, a trip to the Swiss Alps should definitely be on your bucket list. In Le Tour and Grand Montets the views are spectacular and many of the off track trails are untouched. There are skiers jumping off the sides of the mountains with parachutes on their backs who would then glide in the air which was an amazing sight. Hubs and I would cruise off alone without a guide which was a bit daunting at first but after the first few days, I was like a snow leopard cruising the white landscape. Ok maybe not quite as unique as a leopard but more like a polar bear. In Chamonix, the views when going up the gondola are just breathtaking. It seems to go on and on forever. The ice caves in Mer De Glace are just amazing and like no other. It’s a hidden gem in the middle of the mountains that after getting over the fear of falling while walking down the narrow stairs to the base, you will thoroughly enjoy. We experienced many different types of foods throughout France, Italy and Switzerland (yes you can board across the borders!) which was fantastic. Let’s just say they love carbs! We visited many of the historical places as well as took the most intense train ride along the edge of a mountain. I want to experience more of the world once the children are a bit older…perhaps in a few years we can head to Europe again. Until then, first family vacation with both kids and the inlaws to Maui in July with my packable Nora Karina Dress was a success! 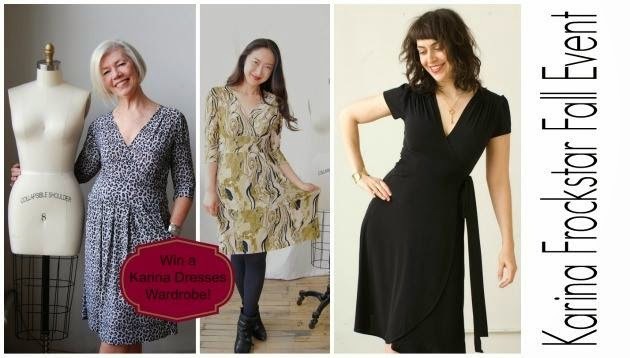 Who wants to win 6 beautiful Karina Dresses? Good luck! I love this dress on you! So pretty! Oh how I would love to visit Europe someday!! Looks like you had fun. You look great and love the dress too. I l ove love love that dress! !!! Colors are gorgeous! I love this dress on you! The style and the bright colors are really flattering! I love the colors! You look great! I love this dress so pretty bright colors makes you feel like spring is here. What a beautiful print - and I typically am not a fan of floral prints. This dress definitely makes you think of spring. That dress looks like a winner for a tropical island! I need one soon for a dance we go to that we dress as if on a cruise. Great choice of dress for you, makes you look incredible! I love the great colours of this dress. You look great! Entry form name: Marlene V.
I really like this dress. I love the colors and the design and fit are perfect! Very pretty/feminine dress. Looks great on you. such a cute dress and the colors remind me of Spring! I love this dress on you. It would be perfect for spring and all summer! The Nora dress is beautiful on you, I love the colors and the movement. Beautiful lady,beautiful dress,great story.thanks so very much for sharing. Love the colors in the dress you are wearing. I own one Karina dress and I love the fabric and the ability to pack it in a suitcase and wear it with little ease while on vacation. That dress looks so pretty on you!! I haven't snow skied in my life yet and I may have waited to long to try it since my fear of heights has grown. But I can enjoy the adventure through your story. Thanks for sharing. I really love the colors in this dress! I thought you were going to say that you wore this dress in the Alps, lol! Looks very pretty on you. Nice bright colors. Thanks for the information. Those colors are beautiful on you and really suit you. I love the print as well! Thanks for all you gals do! The Nora dress has wonderful colors. I like the bodice and I know it is a very packable dress for traveling. You make a very lovely petite model. I like the colors of this dress and the scalloped-like way it hangs. 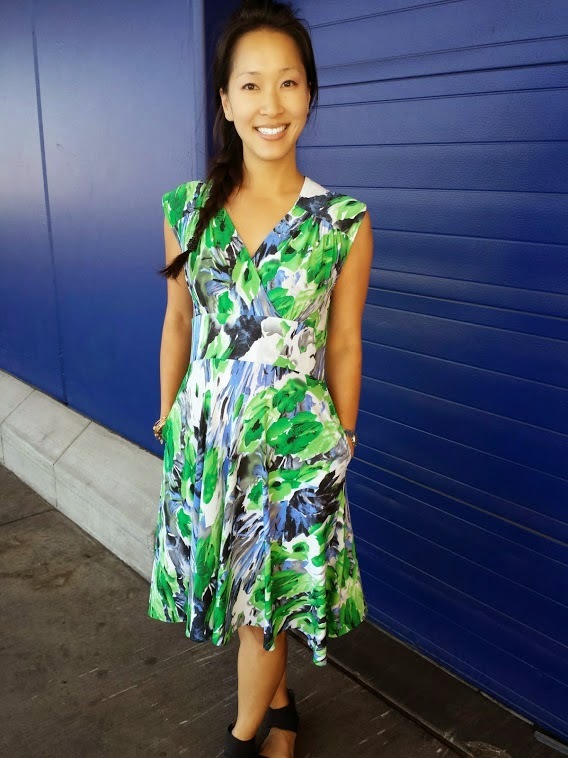 I like the Monet-like pattern on this dress; it's very fitting to pair with a post about Europe! I love the pockets! I think I will sew pockets into every dress I own. The pattern on that dress is beautiful! I love the blue and green combo! I love the colors of this dress and the style. Love the style and colors of this dress and the fit is wonderful, too. Love your dress! It's so colorful and lively. Dresses like this are exactly what I want for the warmer weather! The v-neck and fitted waist would be great for my pear shape! I love this dress. The colors work well together, the shape is super flattering for a lot of different body shapes, it's modest without being too long or falling at an unflattering length....and it looks great on you! I love the vibrant colors of this dress. This really looks like a very great summer dress. I love that dress, so pretty. This dress is very becoming on you. Love the colors. That dress is a breath of Spring! Love your vacation photos! And the Nora Dress...Very flattering! The waist line is beautiful and the colors are so vibrant. It is so nice to have clothes that travel well. No one likes wrinkles in their vacation photos. Thanks for sharing! The dress is beautiful. The Swiss Alps looks like fun. I love that dress, green seems to be the colour for spring this year! It looks so comfy, love it!! !